We're previewing the Monster Energy NASCAR Cup, Xfinity, and Camping World Truck Series at ISM Raceway in Phoenix. We'll also give a few updates from the K&N Pro Series, ARCA Racing Series, and more. 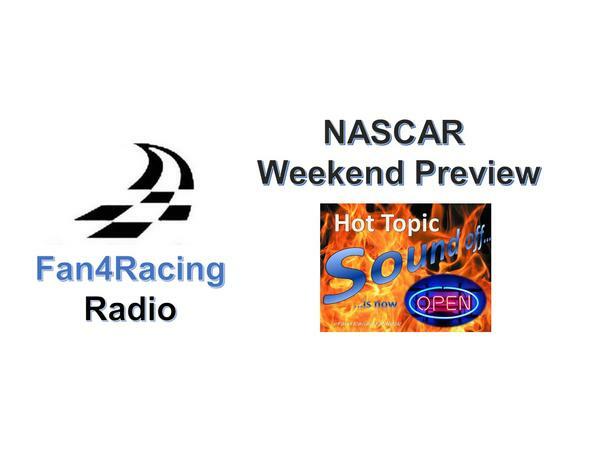 Then, stay tuned for Fan4Racing NASCAR Hot Topics Sound Off from 10 to 10:30 pm ET with co-host Andy Laskey as we discuss all the hottest topics leading into the weekend of racing with our Fan4Racing crew. Our LIVE broadcast begins at 8:30 pm ET, Thursday, November 8, 2018.